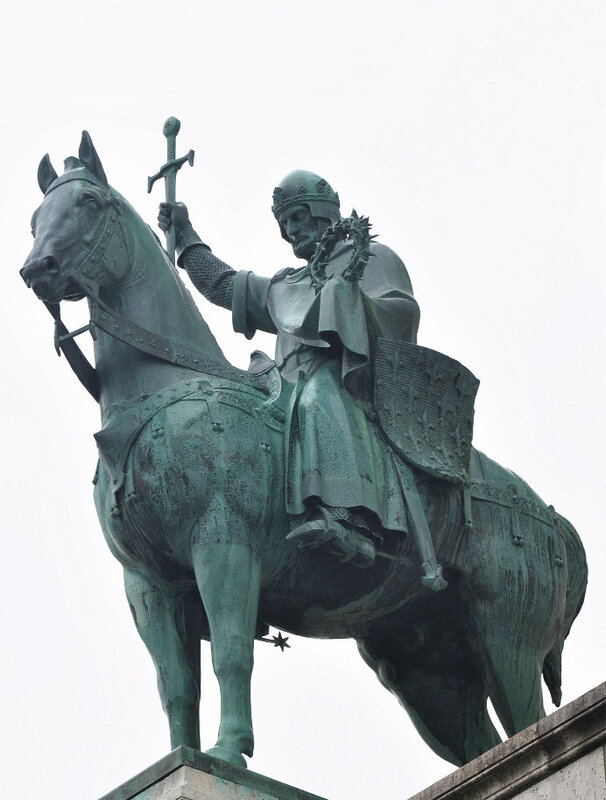 King St. Louis IX of France holding the Crown of Thorns. Statue outside Basilique du Sacré-Coeur in Paris. Baldwin the Second, Emperor of Constantinople, having come to France to solicit the king’s aid against the Greeks, who were besieging that imperial city, thought he would gain the heart of King Louis by making him a present of the Holy Crown of Thorns. He was not mistaken: the king assisted with money and troops, and the precious relic was withdrawn from the hands of the Venetians, and was brought to France. S. Louis went to receive it, five leagues from Sens followed by his whole court and all his clergy; he accompanied it to Paris, with sentiments of compunction and humility, whereof his whole exterior presented sensible marks. He himself bore the Holy Crown from the Church of S. Antoine-des-Champs, in one of the suburbs of Paris, to that of Notre Dame; it was afterwards deposited in the Chapel of S. Nicholas, attached to his palace. Having also received a fragment of the true cross, which the Venetians had obtained from the King of Jerusalem, he caused the Chapel of St. Nicholas to be taken down, and built in the same place as the Holy Chapel (la Sainte Chapelle). He there placed the pious relics of our Redeemer’s Passion, enshrined in gold and precious stones. Every year, on Good Friday, he went thither, clad in his royal robes, the crown on his head, and exposed with his own hands the True Cross to the veneration of the people. Stories From The Catechist by Very Rev. Canon G.E. Howe, Pg. 41-42 #140.